The Uber boycott and Lyft’s ACLU donation herald a new era of corporate politics. 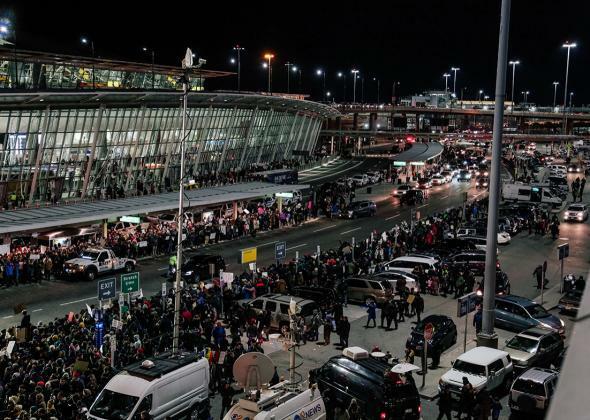 Uber cars filled the gap when yellow cab drivers called a work-stoppage at JFK International Airport on Saturday. We all know the stereotypes about Uber and Lyft, two companies that offer essentially the same service to U.S. drivers and riders. Uber pressures and lobbies state and local governments, and breaks the law until it can make the law. Lyft has been gentler with drivers and regulators, and cultivated a “nice-guy strategy” to go along with the carefree pink mustaches its drivers affix to their cars. The result: Uber steamrolled its way to dominant market share and outplayed its smaller rival on international deals. For the most part, the company’s buccaneering business strategy simply worked—until this past weekend, when it suddenly didn’t. Uber is now the target of a consumer boycott for sending drivers to New York’s John F. Kennedy International Airport during a taxi-driver strike in protest of the Trump administration’s travel ban of nationals of seven majority-Muslim countries. The PR problem has been exacerbated by Uber CEO Travis Kalanick’s role on an economic advisory council to President Trump. Lyft, meanwhile, pledged to donate $1 million over four years to the American Civil Liberties Union, whose lawsuit won Saturday night’s stay of Trump’s ban—earning them goodwill from consumers who saw fit to delete Uber and cancel their accounts. On Sunday, Lyft surpassed Uber in downloads for the first time ever, the Verge reports. The #DeleteUber campaign is an early test case of how companies will maintain consumer loyalty during a period of left-wing activism that has drawn millions of people into the streets. It’s not surprising that Uber, with its ruthless reputation, is the first target. But as resistance to Trump builds over issued like LGBTQ anti-discrimination protections and the Paris Climate Agreement, more traditional companies may find customers frustrated with their silence on political issues. After years of asking corporations to get out of politics, left-wing activists would like them to step up. Later in the evening, the company tried to emphasize that it had not intended to cross the picket line. That night, under the subject line “Standing up for what’s right,” Kalanick shared an email he had sent to Uber employees on Trump’s executive order. But instead of denouncing the ban outright, Kalanick defended his role on the president’s business council. “We’ve taken the view that in order to serve cities you need to give their citizens a voice, a seat at the table,” he said. On Sunday, Kalanick changed his tune, calling the ban “wrong and unjust.” The company has set aside $3 million for a legal defense fund to help drivers who would be separated from their families by the ban and compensate banned drivers for lost earnings. It hasn’t stopped the onslaught of Uber deletions, including support from celebrities like Mark Ruffalo and Carmelo Anthony (a Lyft investor). Here was a lesson in corporate damage control for the Trump era. Lyft, which has saved more than $120 million on vehicle depreciation and gas by classifying drivers as independent contractors, also did not halt service to the airport during the strike. Lyft’s big investors also include Trump confidants Carl Icahn and Peter Thiel. But a big donation and a strongly worded statement from Lyft’s CEO on Sunday made headlines—and paid immediate business dividends. Business practices aside, Uber faces the American political problem in a nutshell. If Kalanick really plans to condemn the immigration order to Trump’s face on Friday—and it’s not clear he does—is that act of defiance worth the legitimacy he and other corporate leaders provide by taking on adviser roles? What is a “seat at the table” worth—and what does it cost? As far as image is concerned, a demonstration of how Uber has weathered the boycott is imminent. On Friday, Politico reported that the company was beginning a new campaign against New York Mayor Bill de Blasio over trip data. The last time the mayor sparred with the company, it quickly organized a campaign of celebrity advocates and press conferences to claim the moral high ground. De Blasio was left humiliated. This time around, it’s harder to imagine the likes of Neil Patrick Harris jumping on board.